The International Human Rights Funders Group (IHRFG) and the Foundation Center in collaboration with Ariadne/European Human Rights Funders Network and the International Network of Women’s Funds (INWF), recently launched Advancing Human Rights: The State of Global Foundation Grantmaking (executive reports in Spanish and French available). Ron: What did your research discover? We found that in 2010, 703 foundations based in 29 countries gave $1.2 billion dollars to support human rights. These foundations made over 12,000 grants to 6,800 organizations worldwide. 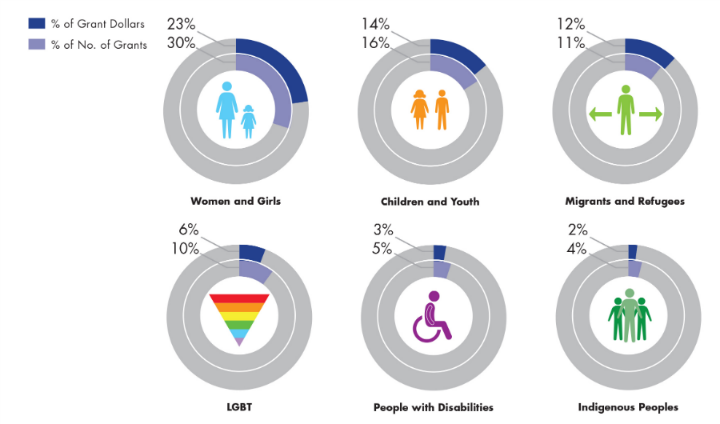 The percentage devoted to human rights work in North America may seem surprisingly high. We found that several large, U.S.-based foundations supported efforts met our definition of “human rights,” even though those grantmakers don’t self-identify as supporting human rights. One example is the W.K. Kellogg Foundation’s focus on “diversity, inclusion, and equity,” and its promotion of access to education and healthcare for U.S. children in poverty. This study’s definition held that, “Human rights funding … seeks systemic change in the implementation of rights … for individuals, communities, institutions, and movements.” We hope to encourage rights funders and NGOs to engage with these ‘less-likely allies,’ building a broader constituency of support for human rights. Ron: Who received the funds? 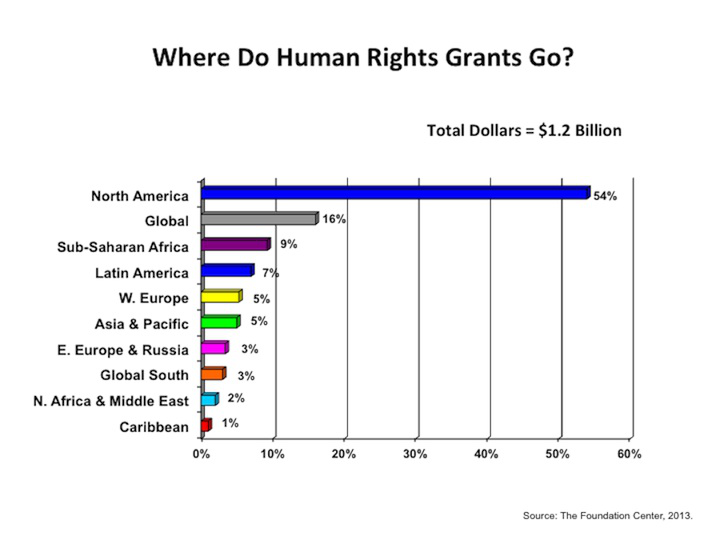 This graph shows the location of recipients of human rights grants. 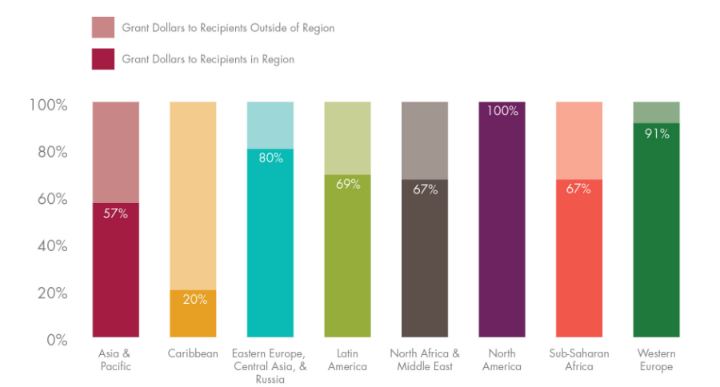 For all regions, except for the Caribbean, close to 2/3rds of human rights funding for that region went directly to organizations based there. The remaining amount was granted to organizations located outside of the region for human rights work benefiting that region. 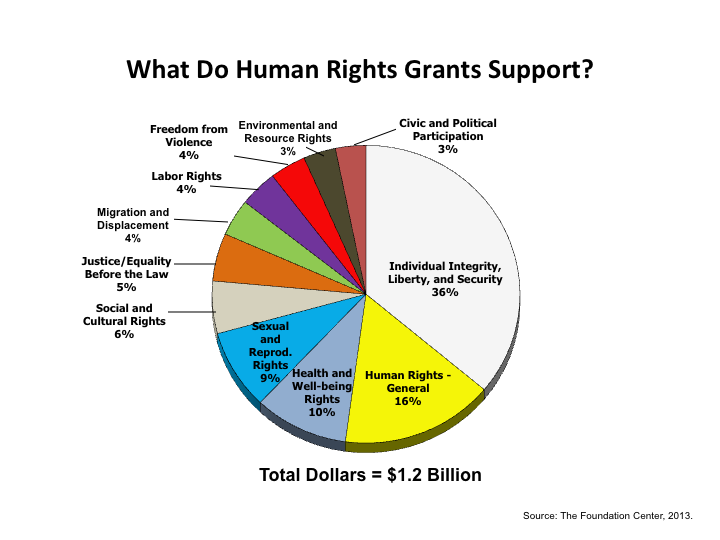 Ron: What issues do these human rights grants support? Two notes: In our study, Individual Integrity, Liberty, and Security includes the right to equality, which are any grants made in support of a particular population (e.g. “LGBT rights”) that did not specify the particular right(s) supported. Human Rights – General includes grants whose descriptions were intentionally vague to protect grantee safety, as well as core support grants to organizations that work on many rights issues. Ron: Are human rights activities in the Global South and former communist countries heavily dependent on funding from northern foundations, governments, NGOs, and private donors? Dobson: In our research, 97% of foundation human rights funding originated with funders in the Global North and 3% from funders in the Global South. We believe that this in part reflects the current reality, but it also paints an incomplete picture. Information about the grantmaking of North American foundations is easier to access. 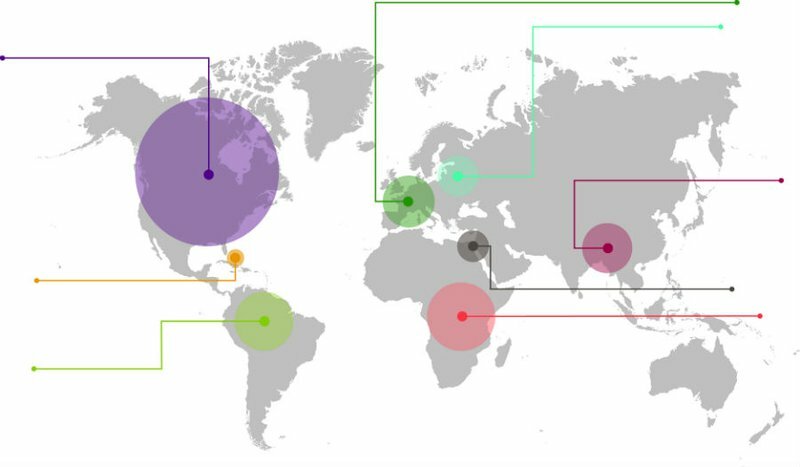 Based on our data set, foundations in the Global South (21 funders based in 17 countries) made 634 human rights grants totaling over $8 million. Our priority moving forward is collecting data from additional funders based outside of North America, as well as from governments and inter-governmental organizations. Carrasco Scherer and de León: While it is true that many civil society organizations and local funders continue to depend on northern foundation funding, recently we have seen a larger share of women’s funds broaden their funding sources. The Korean Foundation for Women, as one example, is sustained by corporate funding (64.3% of budget) and funding from individuals (36.6%). A clear downside to relying on foreign funding is the harm to local movements and organizations if that funding is lost, particularly those working on more ‘controversial’ issues, such as sexual and reproductive rights and land rights. Joint fundraising initiatives, which involve two or more funds mobilizing resources together for a specific issue, are one innovative development to counter the lack of available funding. Ron: Can you reflect more on the gap between the US and EU, and the rest of the world? What do you think contributes to this gap? Dobson: Last year we interviewed a group of 25 foundation staff based in nine countries about their perspectives on human rights philanthropy. Many highlighted the trend that human rights funding is increasingly shaped by regional/local contexts, shifting away from a northern-dominated model. Two key vehicles are the growth of regional rights funders, such as the Arab Human Rights Fund, and the growth of women’s funds across the globe. Carrasco Scherer and de León: Our members repeatedly note that most existing local resources are geared toward direct service rather than structural change. The lack of a philanthropic culture and, in our context, the lack of a feminist philanthropic culture, remains two of the biggest challenges to overcome. Growing economies in Latin America, Africa and Asia are resulting in both great inequality and a burgeoning middle class. It is precisely among the middle class that feminist philanthropy can thrive. Moving away from a culture that sees women and girls as secondary citizens whose rights are negotiable or `too expensive’ requires awareness-raising and financial commitment. A number of funders based in the north remain skeptical of southern organizations’ ability to overcome the funding gap, and yet there is little support provided for the creation of endowments or fundraising capacity-building, critical components to sustainability. Ron: What other sources of funding are there for human rights in the Global South? How are they similar from, and different from, those in the US or western Europe? Dobson: There are several significant rights funders based in the Global South, including the Brazil Human Rights Fund, South Asia Women’s Fund and Urgent Action Fund-Africa, as just a few examples. These funders differ from most private northern-based foundations in that they need to raise the funds they grant, and can support difficult-to-reach emerging organizations that lack the capacity to absorb large grants. They often provide seed funding to nascent groups, enabling them to leverage these funds to obtain support from larger donors. In addition, being a local funder often adds legitimacy to grantmaking agendas and grounds strategies in locally-defined priorities, which is particularly critical within contexts with suspicion of foreign funding. Carrasco Scherer and de León: INWF members are diversifying their funding sources, from securing support from individuals to engaging with corporations. For the Global Fund for Women (US), as one example, these sources represent almost 40% of their income. For other members located in contexts where the concept of philanthropy is relatively new, this source represents less than 10% of their budgets. Despite the numerous barriers faced by southern organizations when engaging in local fundraising – lack of understanding of human rights, legal and fiscal restrictions and repression through local power structures – a growing trend among women’s funds is to foster and expand local income sources. Ron: Do human rights donors in the global north think about boosting giving to human rights in the south? Do they give money to build that capacity? Dobson: Yes, some northern funders provide support for skill-building in areas such as fundraising and leadership development. Two examples: Oak Foundation often pays for internationally recognized audits to improve grantees’ financial integrity and fundraising capability. Atlantic Philanthropies supports grantees in undertaking evaluations and strategic learning exercises to bolster their case when approaching new sources of funding as Atlantic spends down its assets. Carrasco Scherer and de León: Yes, there is interest among progressive northern donors who see the value of building up the capacities of southern-based rights organizations. A recent example relates to INWF’s Monitoring and Evaluation Program, supported by several northern donors. This project aims to better understand how change is happening in the advancement of women’s and girls’ rights, and to document how women’s funds are contributing to the field of monitoring and evaluation from a feminist perspective. Ron: Should northern governments, the U.N. and other multi-lateral agencies spend more - or less - money on southern human rights groups? Are there problematic conditions attached to human rights funding from these northern sources? Dobson: Many IHRFG members are working to strengthen southern human rights groups. When asked about contemporary factors influencing human rights philanthropy, almost all interviewees named “shifting global power dynamics” as the most prominent. The Ford Foundation, as one example, has prioritized strengthening a new generation of southern-based human rights organizations to forge expanded roles at the regional and international level. In October 2012, they disbursed major new grants to seven human rights organizations in Latin America, Africa, and Asia. One area of significant concern is increased domestic restrictions on the receipt of foreign funding, such as those passed in Russia and India. What will this mean for local philanthropy? If these laws make it too difficult for some northern-based groups to fund in some southern-contexts, will local philanthropy grow to fill the gap? Or will these policies and increasingly closed space for civil society result in reluctance among local funders to engage with human rights? This remains to be seen. Carrasco Scherer and de León: INWF consists of 46 member funds who give more than 50% of their grant-making budgets to women-led groups in the global South, reaching grantees in more than 170 countries worldwide. In the last 30 years, women’s funds have become one of the top funding sources of feminist movements and women’s rights organizations. The funding priorities of women’s funds are shaped by local priorities, and yet are also influenced by other factors, including donor-driven policies, the availability of resources, and economic and financial policies. Some bilateral and multilateral agencies, including the Dutch government and UN WOMEN have created specific funds to support women’s rights organizations. However, the intersections and potential contradictions between women’s funds’ agendas and the interests of bilateral and multilateral donors may spark some tensions. While there is a need for additional funding for grassroots women’s rights organizations worldwide, there is also a need for more quality funding: funding that is flexible, multi-year, and supports core activities.